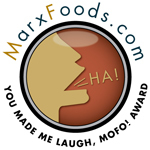 Posted by Toy Lady in meal plan monday, mirth & woe, Musings. 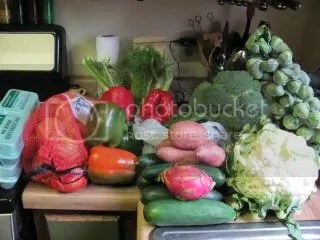 Another market week – and again, tons of nice veggies for, well, not too much money! Though I’ll admit, we cut it close this week – I paid for the cucumbers in quarters! But we got fresh broccoli, fennel and cauliflower, and the most BEAUTIFUL green peppers! Not to mention the great Brussels sprout tree – I LOVE buying sprouts that fresh! I also got a dragon fruit. I’ve never had one, and I have no idea what to do with it, but the Asian lady I bought it from said it was “very good” and not to throw out the skin – it’ good with fish. We’ll see about that, I guess. The “very good” part, not necessarily the fish part. How many years has it been that I’ve been trying to empty the freezer? I would almost guess it’s been, well, Peeps says he’s been here for Defrosting Day once. And that’s been in 12 years. However, this one is done, and now it’s been thoroughly cleaned and is in the process of being restocked. The sad part? 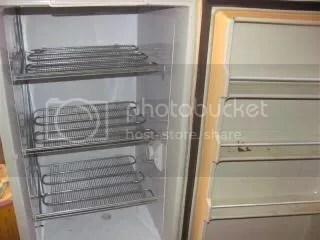 We have a chest freezer that also needs to be defrosted. . . 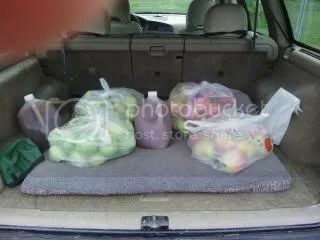 I think I mentioned, last month, that Peeps and I had spent a rigorous quarter hour picking a couple of bags of Honeycrisp apples didn’t I? 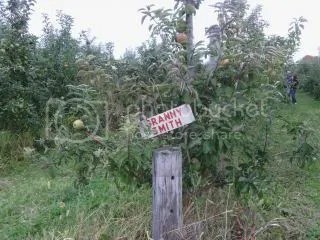 Those are fairly early apples – the Granny Smiths, Braeburns, Empires and Crispins are much later – like now. So we hauled ourselves out to the orchard and ended up with 50 more pounds of apples, plus a couple of gallons of cider for good measure. My motto is anything worth doing is worth overdoing. Hey, an apple a day, right? Oh my gosh, I am SO THRILLED about this! I finally found magnetic knife strips that will actually hold all of our knives – even the big, heavy chef’s knife! Some of the blades were too big for one knife block, then we got another, and it just took up too much real estate on the counter – but no more! All the knives that are in regular circulation are safely tucked away under the cabinet, but right within hand’s reach – yay! I mentioned I bought a bunch of vegetables, right? Mostly I eat them with my lunch at work – it turns out that a whole bowl full of cucumbers, peppers and cauliflower is about 14 calories! But I don’t know, I might be heading perilously close to “going overboard” – what do you think? Eggnog is out. 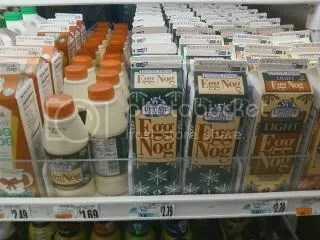 The supermarket this weekend had an entire shelf of the dairy section devoted to that SEASONAL beverage. Dudes, it’s OCTOBER. We shouldn’t be seeing eggnog until at LEAST Thanksgiving, and, ideally, AFTER THAT. Monday – We pulled a package of chicken wings out of the freezer because we’d seen these baked parmesan wings – don’t they look good? Of course, wings don’t make a full meal, so we’ll add some potatoes and broccoli. Tuesday – The lamb ragout worked out well – last week and it was so easy! We had plenty left over, so some went home with The Boy, and the rest, we’ll have, this time with pasta. Wednesday – Even though we’re TRYING to empty and defrost freezers, we just couldn’t resist roasting chickens on sale for 69 cents a pound. So, we’ll be roasting a bird, along with some baby potatoes and Brussels sprouts. I think roasted chicken and sprouts would do very well with some sort of an herby dijon butter sauce, don’t you? Thursday – Another thing we found in the freezer was a package of lamb chunks Peeps had stashed away until he got around to making sausage. Well, he got around to it. It’s got kind of a Moroccan vibe to it – seasoned with garlic, cumin and a bit of cinnamon – and we decided a nice soup would be just the thing. Sauteed some aromatics (leeks and carrots and a couple of cloves of minced garlic), then added the same spices – cumin and cinnamon. A couple of pints of chicken stock and some chick peas (also from the freezer), and, once that’s come to a boil, he dropped little lamb sausage meatballs into the broth, kind of albondigas-style. We added a handful of chopped spinach to call it a complete meal. Friday – Again with pizza night! The tomatoes are STILL hanging in there (sort of) although they’re getting pretty sad. 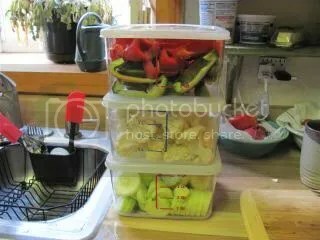 If I don’t have fresh tomatoes, we have plenty of sauce in the freezer that we made when we DID have fresh tomatoes (and eggplant), so it’s all good. Good for you on the defrosting! I need to do that. 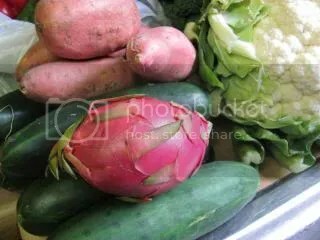 I’ve never heard of a dragon fruit either — I’ll be anxious to hear your report 🙂 All those fresh veggies: you are going to be so healthy! And all those wonderful apples! I would love to buy more Honeycrisps, but they’re about twice the price of “regular” apples here, so I make do with the others. They are quite a treat, though. Anything with lamb sounds good to me! Yum. And the apples will be turning into? sauce, tort, butter, pie? Further details are needed in the coming days. Good find with the knife strip. Makes for a lot more counter room. Have a healthy week! Oh! An empty freezer? I would so love that to happen! We’re having a major crowd for Thanksgiving and so I’m already thinking “make ahead and freeze” for the side dishes, gravy, etc. But the freezers are so full, no room! YIKES – need a Plan B. Well, it wasn’t empty for long, that’s for sure! 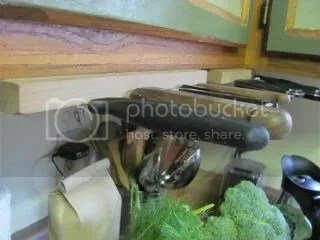 Question on the knife strips: Did you just put one, or is there another one further back under the cabinet to catch further down the knives? I have a giant tile backsplash on BOTH kitchen walls over counters, and the third is open to the den, so the under-the-cabinet thing sounds good to me. You can, btw, find good deals on knife strips (and knives and lots of other good kitchen-y things at http://www.cutleryandmore.com, where I just caught a helluva deal on three Shun knives and a steel for $200. They had some strips on sale (they have a clearance section on the site!). Oh, and I’m buying a half-bushel of Arkansas Black apples next week to make apple butter! Kay – I’ve drooled over that site before, I think. 🙂 And that is a very nice deal on the Shun knives. . . but no. I don’t NEED more knives! It’s just one knife strip under the front lip of the cabinet – it’s great! I got this one from Michael Ruhlman’s Open Sky store (looks like they’re cheaper here – darn it!) I bought a couple of strips a few years ago, and they were garbage. Would barely hold a paring knife. . . now they’re holding spice tins. I’ve never seen Arkansas black apples – I don’t think they’re common around here.